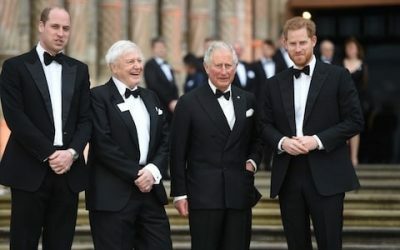 Sir David Attenborough welcomed the Prince of Wales, the Duke of Cambridge and the Duke of Sussex to the Global Premiere of “Our Planet” at the Natural History Museum in London, on April 4th, 2019. 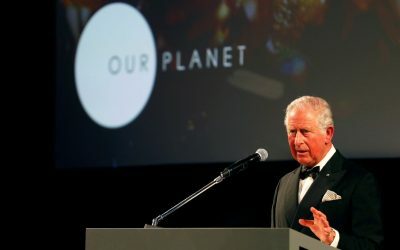 Prince Charles, who is president of the World Wildlife Fund UK (WWF) said: “I must say I was enormously touched to have been asked here this evening along with both of my sons to launch this really remarkable series”. 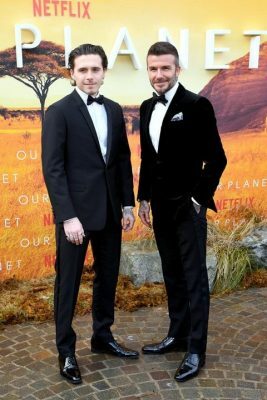 The Price of Wales spoke of his “great pride” at watching his sons adopt the causes close to his heart, as they teamed up for a rare family outing as a trio to highlight the importance of protecting the planet. 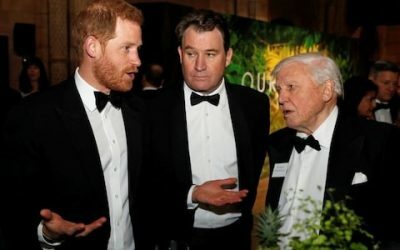 “It is also a much awaited opportunity to pay tribute to and thank Sir David Attenborough for all he has done over so many years to bring the wonder, the fascination and increasingly the desperate plight of the natural world to our attention. “Above all he has done so much to lift the veil of ignorance from our eyes about the integrated and intricate beauty of our home. “The film of Our Planet, so astonishingly crafted by Silverback Films and with the support of WWF and Netflix, will I pray, help to provide an essential means of reaching and teaching hundreds of millions of people around the world. “Education about what we have, what we destroyed and what can and must be regenerated could not be more timely or more urgently needed. “I must say I often wonder why we have waited so long to take the action we were so evidently required to do. “In the last 50 years, we have cleared of 50 per cent of the world’s rainforests, we have destroyed 50 per cent of our coral reefs, poisoned our rivers and indeed whole swathes of the ocean with the run of industrialised agriculture, and have dumped hundreds of millions of tons of plastic into the oceans as well. Of course in doing so, we have instigated the world’s 6th mass extinction event and have accelerated CO2 emissions to the extent that climate change is now a very real existential threat to our whole civilisation. “Welcome Ladies and Gentlemen, to the Anthropocene, an epoch formed by the impact of man. “The greatest crime of all is that we knew what we were doing – informed consent being the basis of democracy, should we not reject informed destruction as the basis of catastrophe. “And it appears we have only belatedly, partially and somewhat reluctantly come to the realisation that our planet does not refer to the hour of homo sapiens, but rather to the whole astounding miracle of life on earth. “We share it equally and as is become only to obvious, for our own survival we desperately need the rest of the natural world with which we are intimately interconnected but which we have been taught to exploit and dominate as something entirely separate from ourselves. “My sons are both keen to remind me that we know what the problem is, we no longer need permission to act but the priority is now to focus urgently on finding and implementing solutions. ‘It is also glaringly obvious as we look around our world that these solutions need to heal the environment and our society. The premiere, at London’s Natural History Museum was hosted by Sir David Attenborough. The 92 year old narrates the eight part series which has taken four years to film, involved 3,500 filming days with 600 crew and aims to reach one billion people on the streaming service Netflix. Created in partnership with Silverback Films, and WWF, it showcases the planet’s most precious species and fragile habitats, revealing amazing sights on Earth in ways they’ve never been seen using the latest in 4k camera technology. Sir David took to the stage before the film was shown in front of an audience of around 300 guests including The Prince of Wales, the Duke of Cambridge, Duke of Sussex, David Beckham and singer Ellie Goulding. He said: “I’ve always believed that few people will protect the natural world if they don’t first love and understand it. “Our Planet” has been a true labour of love for hundreds of film makers, cinematographers, conservationists, editors, musicians, production teams, all of whom have brought their best work to this most important story. “A story that could not be more universal or timely. Sir David paid tribute to Prince Charles for having a “deep understanding of the natural world” and celebrated “his passion and curiosity” for “clearly inspiring the next generation”. The series carries an overtly environmental message exploring the natural world and how to protect it. Ellie Goulding has written “In This Together”, an original song for Our Planet, with Oscar-winning composer Steven Price, who has created the original score for eight-part natural history show. 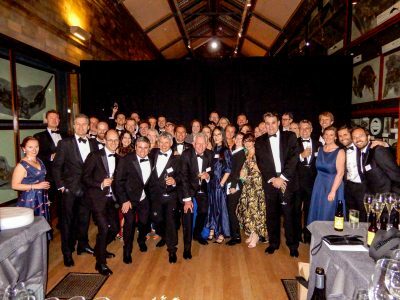 The combined Our Planet team of Silverback, Netflix and WWF at the end of the evening at the museum.